A four-month-old boy died in his sleep to be found lifeless in his cot by heartbroken parents on Boxing Day. 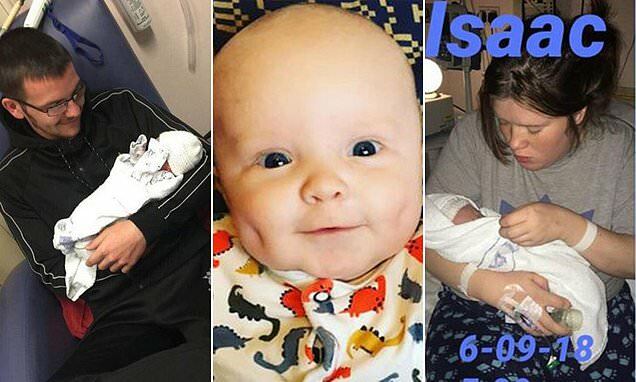 Georgina Marshall was left screaming when she discovered her son, Isaac, was not breathing. The 20-year-old said her baby was born five weeks prematurely in September but was a 'healthy, happy baby who was always smiling'. The mother, from St Ann's, Nottinghamshire, said: 'I walked in to give him a feed on Boxing Day morning and saw he wasn't breathing. 'I started giving him compressions and my mum came in to help. 'I was screaming and panicking. I want to raise awareness of how sudden it can be. Make sure you enjoy the time you have got with your son or daughter.